I met Numi co-founder, Ahmed Rahim, back in the late 90’s at a coffee & tea trade show in Portland. Back then, tea was just starting to ride the wave of popularity in the NW and Numi was testing the waters. Flash forward 14 years and Ahmed and his sister, Reem, have made lots of smart choices. I especially applaud their persistence in a product that is non-GMO, organic and eco-friendly. 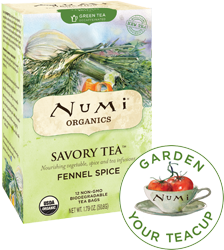 For store bought bagged tea, Numi can be trusted for decent taste at fair prices. Enter their new line of Savory Tea – six garden blends featuring veggies, tea and spices. Long popular in Europe, veggie tisanes haven’t impressed the American market. But being a huge fan of celery root and fennel, I was excited to try this new Fennel Spice. Unfortunately, it sounded much better than it tasted. You get the fennel flavor but not much else and it has a huge after taste of black pepper. I like unusual brews but this was not enjoyable. I don’t see this line flying off the shelf – UNLESS – you use it for cooking or Bloody Mary’s. (They actually do suggest it for rice or noodles.) I’ll keep these on hand for soup vs. sipping. Too bad the clever packaging and creative idea didn’t deliver. We’ll see what the marketing team does with this one and watch for new offerings down the road.